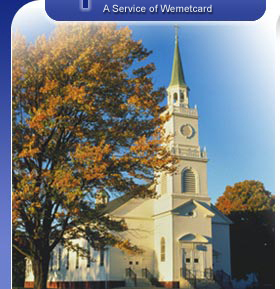 Member Contact Service - WeMetCard Inc.
Help your church maintain updated address & contact information and donate at the same time! Churches often have outdated address and contact information for church members who have relocated, and therefore receive many returned contribution statements for donations, tithes and offerings, along with other returned church mail pieces. Endeavoring to make sure parishioners receive their statements in order to submit correct documentation for tax purposes, causes extra work and additional mailing costs. Now, any church office personell can quickly verify member information before mailing or get updated member contact information, simply by going to MemberContactService.com and entering a member's "Member Contact Code". Office personnel can then contact the member directly or send an email message through the automated system, requesting any additional updated information needed for church records. Member database information is encrypted and secure. No address information is displayed online, and your personal email address remains private at all times. In addition to helping your church maintain updated contact information, 40% of your annual membership fee of $9.95 is donated directly to your church. Membership also gives you automatic FREE access to the entire WeMetCard Contact Services System with all Premium Member benefits! Click here to see what's included. You may also download the church member information flyer. Download Member Contact Form and submit it to your church office. You may also fill in the online form and then print it out. © Copyright 2008 - Member Contact Service - All rights reserved.